Orion Project | ATAC Resources Ltd.
BDO-18-018 returned 10.73 m of 7.20 g/t gold 285 m east of the Anubis discovery. Four holes assessed discrete geophysical or geochemical anomalies. The 18 km² Anubis Cluster is underlain by favourable mid-Paleozoic limestone, silty limestone, shales and calcareous siltstones that are cut by a network of regional scale faults. Two of these regional faults – the Anubis and Northern faults – are extensional features that are believed to be mineralizing fluid conduits. Smaller scale cross-cutting faults show strong evidence for hydrothermal alteration and are also potential areas for mineralizing fluid focus. Mineralization in the Anubis Cluster shows characteristics are consistent with Carlin-type gold mineralization, as do other targets along the Nadaleen Trend. The Anubis discovery outcrop consists of highly fractured, strongly folded, jasperoid altered and decarbonatized siltstone and shale. Extensive soil geochemical anomalies in the Anubis Cluster occur with well-developed hydrothermal clay alteration developed in proximity to the feeder fault systems. The large-scale pathfinder element geochemical footprint suggests a very large Carlin-type environment with a long-lived plumbing system. The Anubis area is covered by a thin layer of overburden making trenching challenging. However, despite the poor bedrock exposure, the pathfinder element + gold geochemical footprint in the Anubis area is stronger and larger than that of the much better defined Carlin-type gold mineralization in the Osiris Cluster, 10 km to the east. 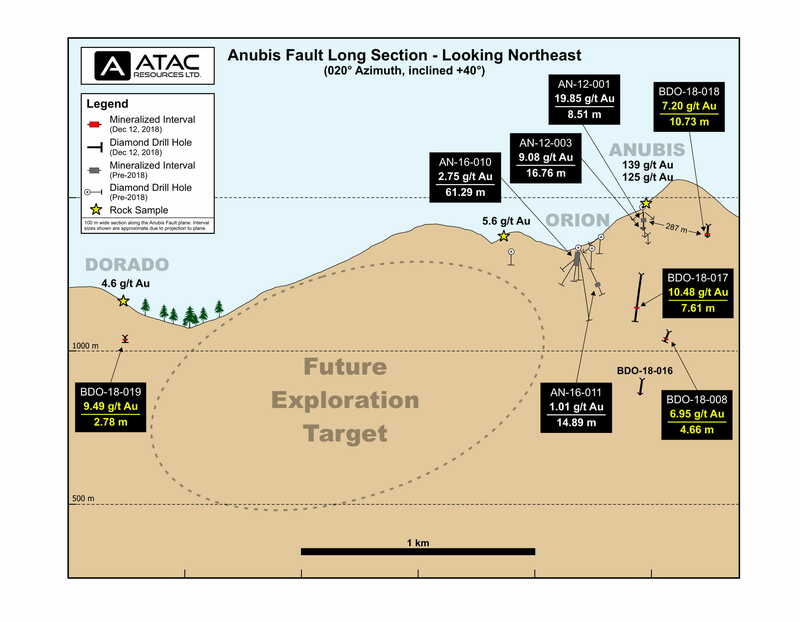 ATAC completed a six week RAB drilling program at the Anubis Cluster in 2015 which was successful in identifying bedrock sources of gold that are likely responsible for the adjacent surface geochemical anomalies. Numerous targets remain untested within the Anubis Cluster. The most significant results from the RAB program resulted in the discovery of a new target of mineralization, 300 m west of the original Anubis discovery. 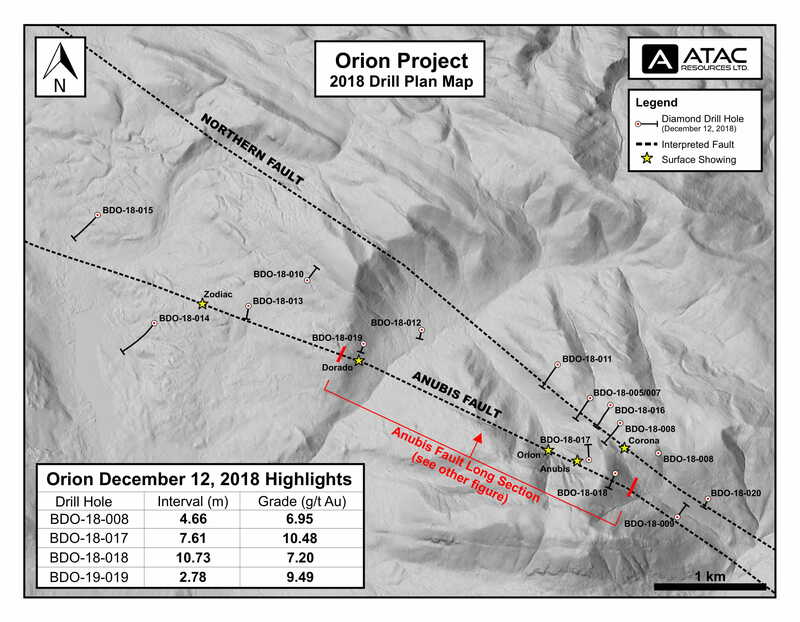 This new target named Orion, intersected 47.24 m of 3.79 g/t gold and was the only hole from the program that was oriented to the north into a pyritic siltstone assemblage. Orion and the pyritic siltstone unit will be a focus of future exploration programs within the Anubis Cluster. This discovery of high-grade silver-lead-zinc mineralization in four widely spaced areas is another very exciting development in the Anubis area. Grab samples from test pits at the Zodiac and Corona targets returned 1.03 g/t gold, 460 g/t (13.42 oz/ton) silver, 11.75% lead and 10.90% zinc and 1.62 g/t gold, 1,490 g/t (43.46 oz/ton) silver and 31.08% lead, respectively. Like the Carlin-type gold mineralization, these base metal targets are associated with fault zones cutting Paleozoic sedimentary rocks. Due to the amount of overburden cover and the early stage of exploration in the area, the relationship between the two styles of mineralization is not clear; however, at the Zodiac showing, Carlin indicator minerals realgar (arsenic) and cinnabar (mercury) clearly overprint silver mineralization. This suggests that the Anubis Fault system is a long lived structure responsible for multiple mineralizing events.